It is my view that science needs to return to the more natural and encompassing approach of the so-called enlightenment period. “Evidence-base” needs to be part of a scientific philosophy that has ethics at its heart. We now live in an age beyond Ivan Illich’s comprehension – and the drivers behind what the BMJ now calls “too much medicine” are many. These include: advancement in technology, a human need for certainty, the search for simple answers to complex questions, commercialisation, and marketing. This is not an exhaustive list, and no doubt you can find many other potential contributors. I will end by arguing that we need the narrative of people, philosophy and ethics to restore the integrity of science. Each year, in the United Kingdom, the Pharmaceutical Industry spends over £40 million on paid opinion leaders. There is currently no meaningful way of knowing the details of this as the only central register available is based on voluntary disclosure. Evidence gathered for PE1493, the petition I raised for a Sunshine Act for Scotland, indicated that much of this £40 million went to a relatively small but highly influential group of opinion leaders, most of whom are involved in determining and providing continuing medical education (CME). PE1493 established this was true for most, if not all, medical specialties. What follows is based on the specialty of psychiatry simply because this is the specialty in which I have spent my career and with which I am most familiar. Here are some of the paid opinion leaders in UK psychiatry [I have used information available in the public domain to construct visual summaries of the competing interests of some key opinion leaders. I have done so in the spirit of the relevant guidance of the Royal College of Psychiatrists]. 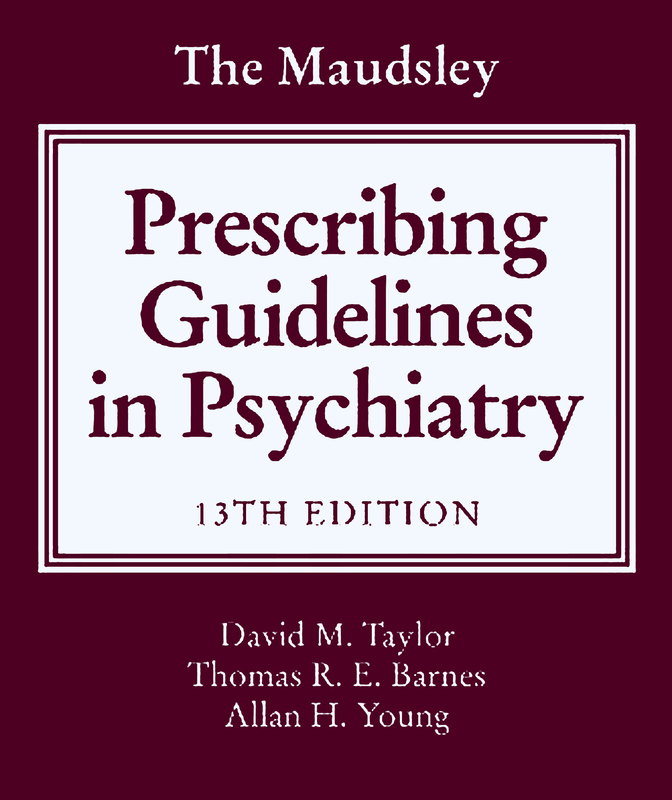 (2) The second film begins with the 52nd Maudsley debate:“This house believes that the long term use of psychiatric medications is causing more harm than good” sharing Professor Allan Young’s declarations. The film finishes with Professor Allan Young giving his declarations at several other accredited-CME events. Professor Allan Young is President of the British Association for Psychopharmacology and was previously Chair of the Psychopharmacology Committee of the Royal College of Psychiatrists. “I was paid to sit on an advisory board for Janssen for a short period in the 1990s and I have in the past been paid to give talks at sponsored symposia. I have not accepted any payments from Industry since 2001 when I became interested in conducting clinical trials. I had before then mostly been an imager and interested in phenomenology, but when I became more of a trialist, it just seemed tidier to not take money. I still get invited to give talks and serve on advisory boards but I don’t accept payment. There are a good number of senior UK psychiatrists who continue to argue that psychiatry is not significantly influenced by the pharmaceutical industry. Dr Samei Huda for example has called efforts to encourage transparency as being little more than “propaganda”. This is a huge topic and one that no summary can do justice to. Medical practice relies on Guidelines as the best medium for sharing evidence of science. Professor Sir David Haslam, Chair of NICE Guidelines, in an interview in June 2016 said “The mantra that I’ve given in every lecture is that they’re guidelines and not tramlines.” This is advice that I agree with, but in practice where doctors are regulated, the fear of departing from evidence means that practitioners are more likely to practice defensively and so follow the tramlines. The All Trials campaign has established that results from around half of all clinical trials remain hidden, and that “trials with negative results are twice as likely to remain unreported as those with positive results. This means that people who make decisions about medicines don’t have full information about the benefits and risks of treatments we use every day.” This is the same evidence that forms the basis of Guidelines like NICE and SIGN. All Hole Ousia posts on BAP can be read here. Again this is an area impossible to summarise and so I will focus on only two organisations involved in how the media represents the science of mental health. The Science Media Centre (SMC) is a nonprofit PR agency started in the UK that gets its largest block of funding from industry groups. SMC was created “to help renew public trust in science by working to promote more balanced, accurate and rational coverage of the controversial science stories that now regularly hit the headlines,” according to its consultation report. It is interesting to consider those involved in setting up and who remain involved with the SMC in terms of the powerful position of narrative control that this agency now has over scientific understanding. There was little mention that the meta-analysis was based entirely on short-term studies (average 8-12 weeks) and that only potential benefits, and not potential harms, had been considered. In November 2018 the Science Media Centre invited speakers to discuss “eliminating treatment-resistant depression” including Prof Allan Young, Prof Anthony Cleare, Dr James Stone, and Dr James Rucker. No speaker declarations have been made public by the SMC for this “discussion”. 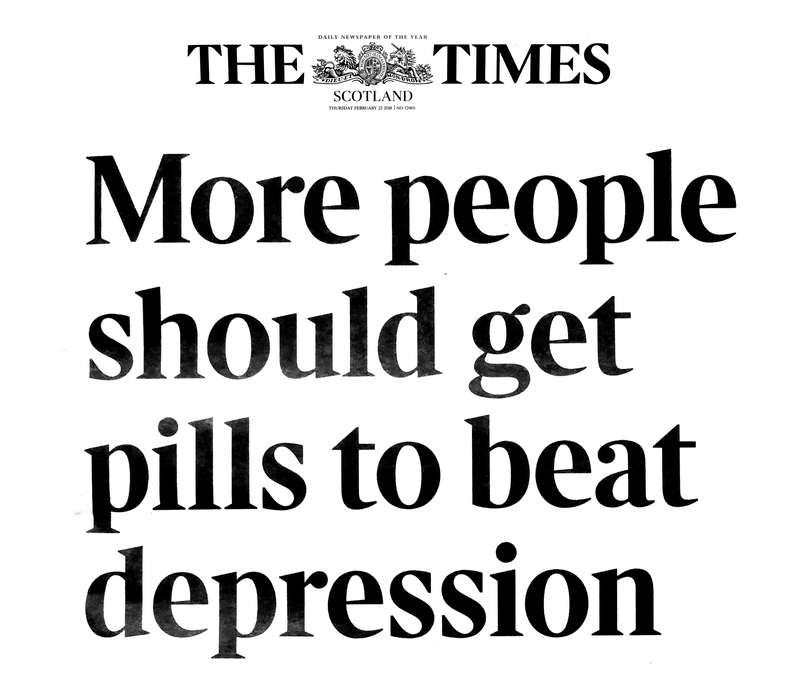 On the 18th December 2018 the BMJ had a News article “Treatment Resistant Depression: what are the options?” which would seem to be based upon this SMC “discussion”. No competing interests were given for the opinion leaders mentioned in this BMJ article which made recommendations of “second line options” with new medications such as vortioxetine (Brintellix). This BMJ article also sought to make the medical profession aware of “new treatments on the horizon” including Psilocybin and Ketamine. The rapid responses to this BMJ article make interesting reading. The Media Centre of the Royal College of Psychiatrists “provides journalists with information and comment on a wide range of issues relating to psychiatry, mental health and the work of the College”. One of the reasons that I resigned from the Royal College of Psychiatrists after nearly quarter of a century’s membership related to the way the College Media Centre, and those advising it at a senior level, have taken an approach where only the positive aspects of any psychiatric intervention are discussed and shared. Science does not work in this way. We can only learn and improve if all experience is valued. The Royal College of Psychiatrists, like other Royal Colleges has developed a culture of awards. 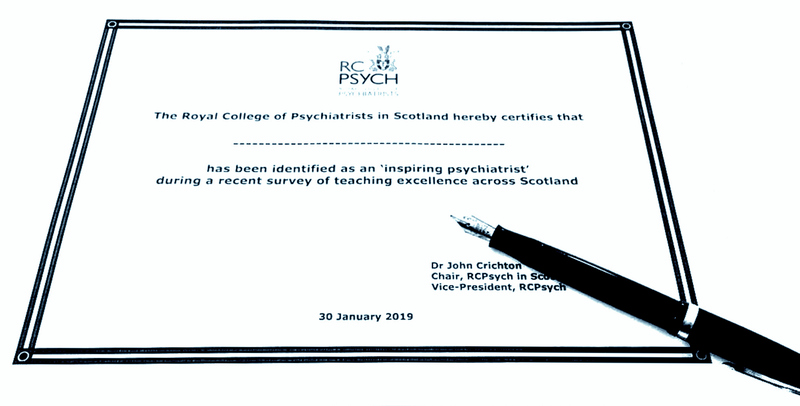 I have expressed my personal view before that I am not sure that such a system, which encourages deference over candour, facilitates “realistic psychiatry”. Following on from this, I wrote to all the UK Royal Colleges and other organisations involved in medical education asking if they support sunshine legislation or not? By the end of last year I had received 9 responses out of the 24. I had no reply from the General Medical Council (GMC) Chief Executive and no reply from the Academy of Medical Royal Colleges. Unlike the USA and France, the UK has no Sunshine legislation. In September 2013 I petitioned the Scottish Parliament to urge the Scottish Government to introduce a Sunshine Act for Scotland. In March 2016, the Scottish Health Council published a report on a public consultation on this. The report demonstrated that the majority of those consulted supported the petition’s recommendations. Yet, here we are, not far off three years later, and the Scottish Government seems to have done almost nothing. It is a requirement for registration with the GMC for all UK doctors to undertake Continuing Medical Education (CME) to continue to practice. Each year, all doctors must gain sufficient CME points to satisfy their respective Royal College. In this post I have tried to outline those who may control much of the narrative of this education. Ethics and philosophy are vital if we are to restore the integrity of science. We need full transparency of competing interests. I am of the certain view that Sunshine legislation in the UK is a necessary first step, without which the scale of industry-biased medicine will remain hidden. Sunshine legislation is a means towards an ideal where science is not determined by money.